Since OOHLALA Mobile and DubLabs joined forces to create Ready Education, we have been hard at work trying to find a way to bring our respective partners together, present our combined roadmap, and gather important user feedback. When we found out that many of our partners would be attending EDUCAUSE in Denver, we decided to organize Ready Education’s very first User Conference, which took place Monday October 29th, 2018. Our day began with keynote speaker Bryan Alexander, internationally known futurist, researcher, writer, speaker, consultant, and teacher, working at the crossroads of technology and education. Bryan discussed the role of Artificial Intelligence in higher ed, along with the benefits of using Virtual Reality as a teaching tool. One example given was how VR can be used to study proteins in a way never before thought possible. Dr. Alexander then touched on some objections to the over-reliance of technology, including cost and the lack of human contact technology might encourage. Ultimately though, Dr. Alexander concluded that technology shouldn’t replace humans, but instead extend and enrich us; in fact, colleges and universities are the prime places to explore this idea. Following our keynote, we heard from Peter Kovaleski of Oral Roberts University where he presented “The Future of a Connected Campus.” Mr. Kovaleski discussed how students at ORU were able to check on the status of their laundry via their Student Life App, saving them valuable time doing menial tasks. 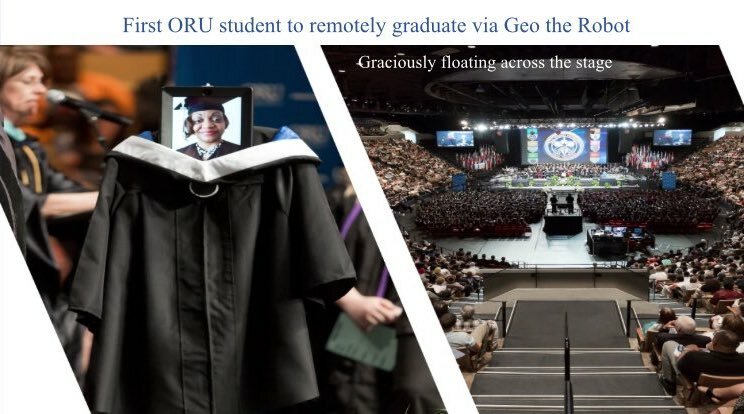 One of the highlights of this session was learning about how ORU had their first student graduate remotely via “Geo the Robot.” Due to health reasons, the student was unable to attend the ceremony in person; however, thanks to innovative minds and technology, she was able to “roll” across the stage with her classmates. Next up, our CSO Chris Hopkinson gave a presentation which explored how redefining communication on campus can help solve institutional challenges. One challenge that many campuses face is fractured communication between departments. More often than not, campuses find themselves using multiple mobile applications to help students get information on services, groups, departments, clubs, etc. In order to remedy this, Chris discussed the benefits of bringing everything together in one platform, making both student and admin lives easier, and more streamlined. After a short break, Ready Education’s Head of Product, Dimitri Poliderakis, went on to present the Ready Education Winter 2019 Commitment: “Getting READY.” As the new “Ready Home” platform will be an amalgamation of the best parts of both the DubLabs mobile app, as well as the OOHLALA Mobile platform, Dimitri was prepared to answer customer questions regarding this merger. Many questions revolved around whether or not the new Ready Home will still retain the hefty integrations that the DubLabs app currently supports, and the short answer is: Yes, the new Ready mobile platform will support integrations. While some aspects of the app will change (including the look), the adjustments that will be made will ultimately be improvements to current features, along with brand new features. The final presentation of the day, “Creating Value: Customer Success,” was given by Alice Dinu, our VP of Student Success & Research, and Leanna Laskey McGrath, our new VP of Customer Success. In “Creating Value” Alice and Leanna went over engagement metrics from current partners (Youngstown State University, Eastern Michigan University, and Arkansas State University), as well as the responsibilities of the Customer Success team. Following this was a discussion on what to expect regarding the transition to the Ready Platform, which included selecting the launch window, integrating with campus systems, centralizing information, and finally launching the platform. Like all good conferences, the first ever Ready Education User Conference finished with a cocktail hour for both the attendees, as well as the Ready team. During this time we absorbed what we’d learned throughout the day, but most importantly, got the chance to get to know each other. We would like to thank all of the staff at the Crowne Plaza Denver for all of their hard work, along with all of our partners who took the time to provide the Ready team with valuable insights and feedback. Until next time! See the rest of the pictures here!